Recently, I was fortunate to have the opportunity to read both the Men’s and Women’s 12 Week Shred Program. What is the 12 Week Shred Program? The 12 Week Shred Program is 12 week program that maximizes both muscle-building and strength building. This is a 5 day a week training program that incorporates hypertrophy and power training elements taken from both bodybuilding and powerlifting training. The program utilizes various intensities of cardio and a variety of forms over the course of the 12 weeks. The program will also guide the trainee through sound nutritional and supplementation protocols that will ultimately help the trainee achieve maximum results! 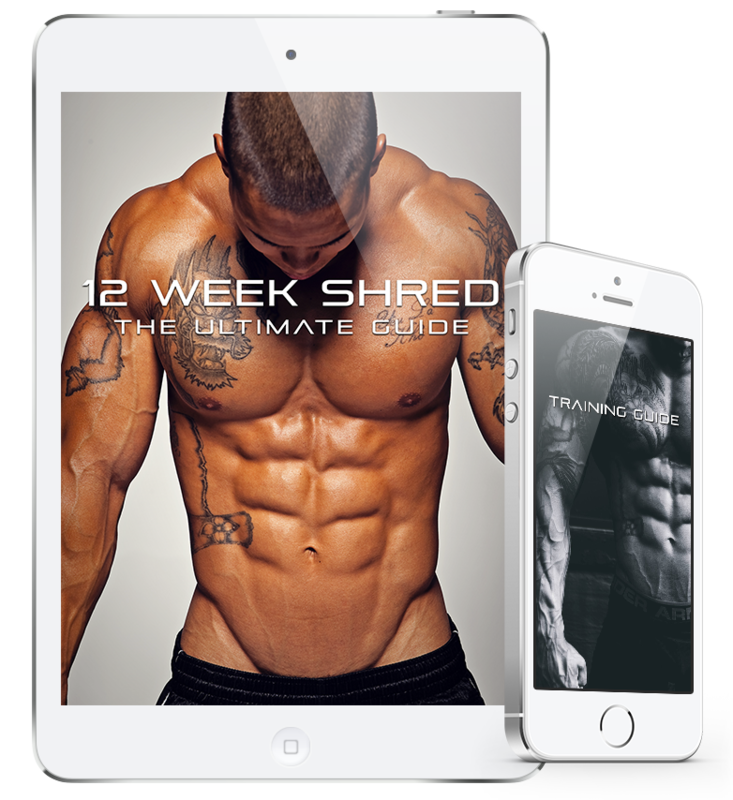 The 12 Week Shred Program is available in a Men’s or Women’s Edition. This program is appropriate for beginners as well as advanced trainees. Trainees must have access to a gym for this program. How can I access the 12 Week Shred Program? Once you’ve purchased the 12 Week Shred Program, you can access the files immediately and print them out, or view them on any electronic device including smart phones and computers. From the start, the program explains everything in detail and the rationale as to why it works! Whether you are a novice or an experienced weightlifter, the exercise glossary is an excellent refresher. For novices you’ll really get a handle on your form which is so important! For more experienced to advanced lifters the exercise glossary will surely help you fine tune your form. And I know after you read it, you will find yourself making little ‘tweaks’ and ‘minor’ adjustments which will be beneficial in the long run; I did! The exercises and training log are laid out in a very systematic fashion. This makes it easy if you are a newbie to the gym. For the more advanced, you will really appreciate how comprehensive the printable training log is. Everything is laid out for you, including the cardio. As the weeks progress the intensity picks up! The Excel spreadsheet for the calorie counter makes it simple to figure out your daily caloric needs. There are also some awesome charts and some suggestions on how to make meal planning a snap. No matter your experience level, you will be motivated to train hard and eat right. There are some variations to both the Men’s and Women’s editions. Whether you’re male or female if you work the 12 Week Shred Program it will work for you! For couples, if you really want a challenge, you could make the 12 Week Shred Program work for you! You would train individually and then, train together for certain exercises. The meal prep could also be done together. Overall, I give this product a 5/5. If you do this program and give it your all, you cannot fail! I would definitely recommend the 12 Week Shred Program to anyone looking to take their training to the next level. For beginners the program will allow you to build a solid foundation and take the guess work out of exercise selection and rep range. For more advanced trainees and experienced weightlifters this will really challenge you and you will certainly take your physique to the next level! And the extensive nutritional information, you will be able to incorporate to help maintain your new ‘look’ well after the 12 week program! The 12 Week Shred Program is the perfect holiday gift for you or someone you love! I hope you found this review of the 12 Week Shred Program helpful. If you did, leave a comment below and share it with your friends. Thanks! I would LOVE to share your transformation in 12 weeks! Drop me a line, and we’ll feature your transformation on Nutrition Beast. Is it program need gym (machine, benchpress, etc) or can only with bodyweight? Yes, you’ll need a gym (bench/weights etc). Would this be good to be used as a cutting program after bulking? Absolutely, Logan! I was able to read the E Book and it really goes into detail for both the diet and training. I think you’ll be very happy with it and the results, as you can make adjustments to meet your own needs. How does this program compare to the Super Shred 8 program? Thanks for contacting us! This program is awesome, but I have not seen the Super Shred 8 program to give you an honest comparison. Thanks for the reply. The honest reply, I appreciate it! You’re very welcome, Sean! If you run either program, we’d love some feedback from you. what if i am not looking to lose weight but simply just shred up is this a good program? Between the weight training and the diet that this program has to offer it will definitely help you shred, and I don’t think you’ll be disappointed. Although this program rocks it sounds like you might need a little one on one help to meet your goals. My good friend Elliot is helping both me and my husband right now and we are very satisfied with his personal one on one help. If you’re interested in having him help you too, go to the contact page on our website and he’ll get back to you! Best of luck reaching your goals. This program did not include direct meal plans and all the information about macros. I have requested a refund and no response yet. I’m sorry you were dissatisfied with the program. You’ll have to contact the company directly as Nutrition Beast has nothing to do with the product other than writing the review. Thanks for the input! how would I post my before and after picture? Hi Arie! Email us your photos and a little bit about your experience and we’ll feature it — info@nutritionbeast.com. Looking forward to it!